My review of the upcoming Jeff Beck guitar tribute Freeway Jam - To Beck And Beck has been published at Modern Guitars Magazine. This is the latest guitar tribute CD produced by Jeff Richman for Tone Center Records, and features Steve Morse, John Scofield, Eric Johnson, Adam Rogers, Mike Stern, Warren Haynes, Chris Duarte, Greg Howe, Walter Trout, and Richman himself on guitars. 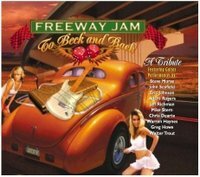 The latest guitar tribute album from Tone Center Records (part of the Shrapnel Label Group) is an homage to Jeff Beck entitled Freeway Jam - To Beck And Back. The label's previous guitar-centric tribute albums honored John Coltrane, Mahavishnu Orchestra, Miles Davis, Steely Dan, and Carlos Santana. As with the previous tribute CDs, producer/arranger Jeff Richman has assembled a fine collection of diverse guitarists for this album. The featured soloists this time around are Steve Morse, John Scofield, Eric Johnson, Adam Rogers, Mike Stern, Warren Haynes, Chris Duarte, Greg Howe, Walter Trout, and Richman himself. The album also includes Vinnie Colaiuta and Simon Phillips on drums, Stu Hamm on bass, and Mitchel Forman on keyboards. Richman plays rhythm guitar on all the tracks, and plays lead on "El Becko". After leaving the Yardbirds, Jeff Beck took a decidedly different path than his fellow British Guitar Gods, Eric Clapton and Jimmy Page. Beck was at the forefront of the burgeoning jazz fusion movement of the 1970s, which makes him a perfect subject for one of Richman's tribute projects. While this disc includes songs from Beck's entire career, the bulk of the songs come from his landmark '70s fusion albums. Richman's bold arrangements are as compelling as the great guitarists featured on these tributes. The opening track, "Freeway Jam" is a perfect example. Steve Morse takes the lead-guitar reins for this one, and while he's played this song countless times in live jam situations, he's never played it quite like this. As Richman has done many times, there are chord changes in his arrangement here that do not appear in the original song. When you hear it, there's no doubt you're listening to a version of the jazz fusion standard. But it sounds like a new song that honors the original; not just Steve Morse jamming on "Freeway Jam". The solo is vintage Morse as well; lots of tumbling alternate-picked runs and aggressive blues licks. Eric Johnson's appearance on "Beck's Bolero" is his best Tone Center tribute performance yet. He just seems to fit in better here than he ever has before (Johnson also appeared on the John Coltrane, Miles Davis, and Carlos Santana tributes). This is largely due to the fact that this sounds like an Eric Johnson song, given Richman's radical re-arrangement of the original. Johnson gives an dynamic, energetic performance with a great tone. Another standout track is "Led Boots" featuring jazzer Adam Rogers. Most versions you hear of "Led Boots" are pretty heavy (see El Grupo, Greg Howe & Richie Kotzen, etc). Here, the Max Middleton-composed classic is given a slightly lighter treatment, but is still beefy enough to keep the energy of the original riff intact. Rogers' tone has a nice snappy-crunch to it that gives him lots of definition for his faster runs; it reminded me of Allan Holdsworth's tone on the old Soft Machine "Bundles" album. I always enjoy hearing how a given player approaches a "modal jam"; that is to say, a solo section that's centered on a single key center or vamp. I love what Rogers does with this one. He mixes short, punchy phrases with hip outside lines to always keep you interested. The song ends with some nice chord changes that Rogers navigates with ease. Richman takes a solo turn himself on "El Becko". This is arguably the best solo spot he's had on any of the tribute albums he's produced. His cool intervallic licks sounds great on this high-energy tune. Greg Howe appears on "Blue Wind", and is a natural choice for this song. He really digs into the groove, and plays some strong bluesy phrases over the changes. There's plenty of Howe's trademark legato runs thrown in as well. Other great performances include John Scofield's jazz-funk take on the Yardbirds song "Over Under Sideways Down", Warren Haynes' great slide work on "The Pump", and Walter Trout's burning rendition of "Brush With The Blues". This is certainly one of Richman's strongest tribute projects yet. There are many great performances by the featured guitarists, and the songs themselves are all fresh, inventive takes on the originals. Well worth picking up.